Is there something you already love doing? Do you have a hobby, or something you loved doing as a child, but never considered it as a possibility? Whether it’s reading comic books, collecting something, making something, creating or building, there is probably a way you could do it for a living. Open a comic book shop, or create a comic book site online. If there’s already something you love doing, you’re ahead of the game. Now you just need to research the possibilities of making money from it. What do you spend hours reading about? For myself, when I get passionate about something, I’ll read about it for hours on end. I’ll buy books and magazines. I’ll spend days on the Internet finding out more. There may be a few possibilities here for you … and all of them are possible career paths. Don’t close your mind to these topics. Look into them. Nothing comes to mind right away? Well, get out a sheet of paper, and start writing down ideas. Anything that comes to mind, write it down. Look around your house, on your computer, on your bookshelf, for inspirations, and just write them down. There are no bad ideas at this stage. Write everything down, and evaluate them later. Ask around, and surf for possibilities. Ask other people for ideas. See what others have discovered as their passions. Look all over the Internet for ideas. The more possibilities you find, the more likely your chances of finding your true passion. Don’t quit your job just yet. If you find your calling, your passion, don’t just turn in your resignation tomorrow. It’s best to stay in your job while you’re researching the possibilities. If you can do your passion as a side job, and build up the income for a few months or a year, that’s even better. It gives you a chance to build up some savings (and if you’re going into business for yourself, you’ll need that cash reserve), while practicing the skills you need. See below for more. It’s best to actually test your new idea before jumping into it as a career. Do it as a hobby or side job at first, so that you can see if it’s really your true calling. You may be passionate about it for a few days, but where the rubber meets the road is whether you’re passionate about it for at least a few months. If you pass this test, you have probably found it. Know as much about your passion as possible. If this has been a passion for awhile, you may have already been doing this. At any rate, do even more research. Read every website possible on the topic, and buy the best books available. Find other people, either in your area or on the Internet, who do what you want to do for a living, and quiz them about the profession. How much do they make? What training and education did they need? What skills are necessary? How did they get their start? What recommendations do they have. Often you’ll find that people are more than willing to give advice. Don’t go into it with amateur skill level. If you want to make money — to be a professional — you need to have professional skills. Get very good at your future career and you will make money at it. Practice for hours on end. If it’s something you love, the practice should be something you want to do. Can’t find your passion at first? Give up after a few days and you’re sure to fail. Keep trying, for months on end if necessary, and you’ll find it eventually. Thought you found your passion but you got tired of it? No problem! Start over again and find a new passion. There may be more than one passion in your lifetime, so explore all the possibilities. Found your passion but haven’t been successful making a living at it? Don’t give up. Keep trying, and try again, until you succeed. Success doesn’t come easy, so giving up early is a sure way to fail. Keep trying, and you’ll get there. What I’ve outlined here is a lot of work … but it will be the best investment you’ve ever made. 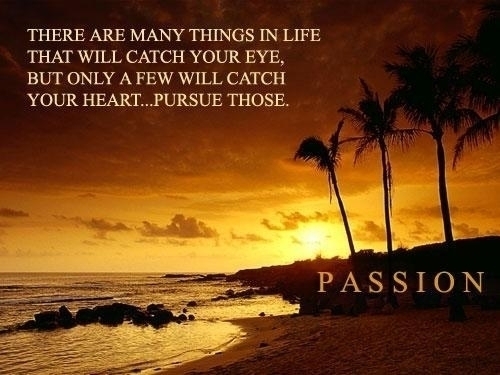 Follow your passion, and you will be truly happy and incredibly fulfilled. I wish you the wildest successes of your wildest dreams!